Both you and your employers can be in breach of your contract if either one of you has not followed the terms agreed in the contract of employment. It’s important to know what ‘breach of employment contract’ means and what you should do if it occurs. To breach, simply put, means to break something. 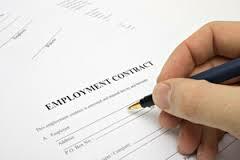 A contract of employment is a legally binding agreement between you and your employer. A breach of contract occurs when one of you breaks one of the terms of that contract. An example might be if your employer doesn’t pay your wages or salary, or you don’t work the hours agreed. Not all the terms of a contract are in written form. A breach may be of a verbally agreed term, a written term, or an ‘implied’ term of a contract. You may be able to sort this out with your employer. But if you can’t, you can decide to take legal action. Think carefully before taking any legal action against your employer and remember that you’ll only get compensation (or ‘damages’) if you can prove real financial loss. There’s no compensation for distress or hurt feelings. Also remember that taking legal action might prompt your employer to take out a counter-claim against you if they feel they have one. In all such cases the legal advice of Stonehewer Moss Solicitors may be the expert help to get you the result you want. Error: Error validating access token: Session has expired on Saturday, 09-Mar-19 13:12:58 PST. The current time is Wednesday, 24-Apr-19 20:02:56 PDT.